There are more than a hundred softwood species in North America. To simplify the supply and use of structural softwood lumber, species having similar strength characteristics, and typically grown in the same region, are combined. Having a smaller number of species combinations makes it easier to design and select an appropriate species and for installation and inspection on the job site. In contrast, non-structural wood products are graded solely on the basis of appearance quality and are typically marked and sold under an individual species (e.g., Eastern White Pine, Western Red Cedar). The Spruce-Pine-Fir (S-P-F) species group grows abundantly throughout Canada and makes up by far the largest proportion of dimension lumber production. The other major commercial species groups for Canadian dimension lumber are Douglas Fir-Larch, Hem-Fir and Northern Species. The four species groups of Canadian lumber and their characteristics are shown below. 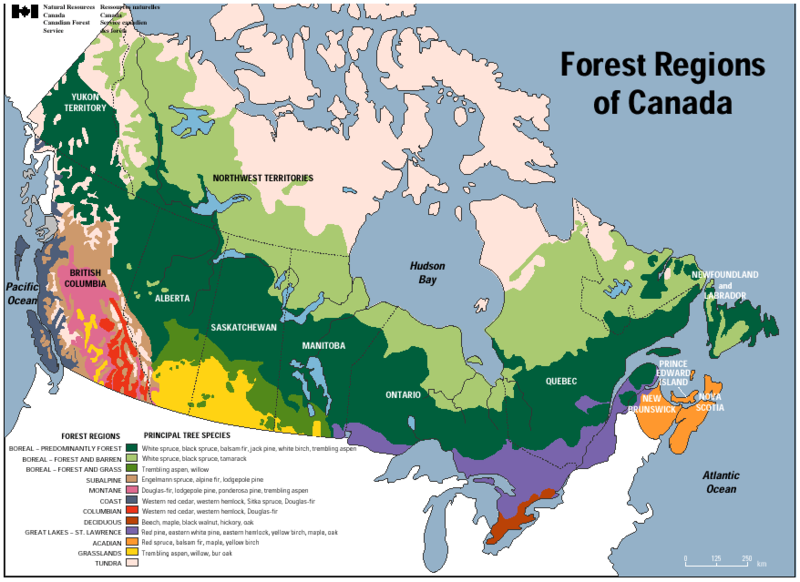 Below is a map of the forest regions in Canada and the principle tree species that grow in each region. This map appears courtesy of Natural Resources Canada.